Key Difference: Monkeys are often small in size with small hands and slightly longer legs. They have opposable thumbs on both their hands and their feet. Apes are usually larger in size and have uneven proportion of hands to legs. Apes have longer hands and a stronger upper body. Apes and monkeys are often used interchangeably, specially when it comes to insulting someone. However, calling someone an ape may not mean the same thing as calling someone a monkey. An ape would be just a primitive version of the human, while monkey, they are a whole different species. Monkeys and Ape are two different types of primates. While both the animals share the same Kingdom, phylum, and class, they are actually very different species. The primate order is characterized with certain traits such as forward-facing eyes, highly flexible arms, legs and fingers. These are common traits that are even found among humans, as we fall under the same category. Primates are divided into two main suborders: the prosimians and the anthropoids. The prosimians include lemurs and tarsiers, which are considered to a more primitive group, while the anthropoids are further divided into monkeys, apes, and hominids. Humans fall under the last group. Anthropoids are classified as having characteristics such as flat faces, small ears and relatively large, complex brains. This group is also known as the higher primates and its inhabitants are considered more advanced and developed. As we go from monkeys to apes and finally humans, the brain complexity is believed to increase. The most common way to distinguish between a monkey and an ape is to look for a tail. 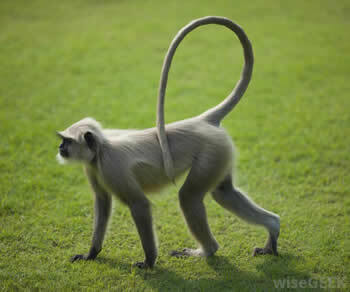 If the creature has a tail, it is a monkey and if it doesn’t or has a small tail, then it is an ape. Although this theory has been criticized as being a little to over simple, and is the reason of why Barbary macaque monkey (Old World monkey) is often classified as an Ape. Monkeys are often small in size with small hands and slightly longer legs. They have opposable thumbs on both their hands and their feet. They usually are found on tree tops and cannot swing from branch to branch, but rather they climb to the tops and run in a similar fashion to a cat. Monkeys posses a smaller brain and have a diet of fruits, vegetables and small insects. Apes are usually larger in size and have uneven proportion of hands to legs. Apes have longer hands and a stronger upper body. This is commonly to be able to swing from branch to branch. 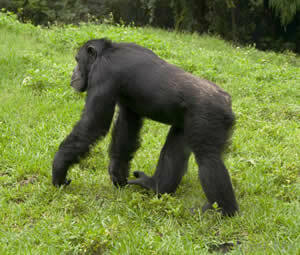 Apes can stand on their hind legs for a decent period of time but prefer to travel on both, their hands and legs. Apes are considered to have a more developed brain, and the ability to understand many things. Scientists have proven this by teaching apes to communicate via sign language or using special keyboards. They have also been seen using tools in their daily lives. Around 23 between Lesser Apes and Great Apes. Africa, Asia, and Central and South America. Life lived almost entirely in trees. Africa and Southern Asia. Life lived at least sometimes on the ground. Great Apes and Lesser Apes only in or near tropical rainforests. Shorter. Quadrupedal. Uses tail as "fifth limb" to help grasp limbs in trees. Longer, usually upright posture. Long arms which are optimal for swinging from branch to branch. Humans entirely bipedal. Omnivorous. Fruits, plants, insects, small invertebrates. Omnivorous. Fruits, plants, insects, small mammals (including monkeys). Can make and use tools for nut-cracking, hunting, and play.